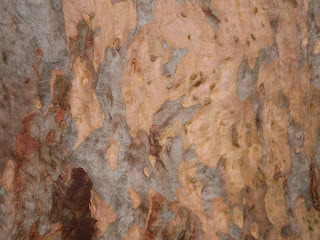 I heard a kind of bark from up in the eucalypt trees. There it is again. I look up bewildered; can't see anything by leaves. Then suddenly, from the canopy, an Ibis lifts off and flies down the river. An Ibis is no small bird but this bird was invisible in the tree as if its black and white feathers merged into the leafy cover. 'Such concealment is all a matter of context. Jays and magpies have black-and-white feathers that are highly conspicuous in the open. But when a bird dives for cover, its outline vanishes, and the white bars and patches look more like splashes of sunlight among the leaves.' My experience exactly. Then there's the enticing black and white striped Carpet Snake but their vanishing perhaps has more to do with them eating the poisonous cane toads rather than being in hiding, waiting to pounce. And animals from Pandas to Lemurs, Shunks to Zebras, Orcas to Colubus Monkeys, many of them serioiusly endangered in their wild, use their colour scheme to deceive. Other birds use their colour to attract. The other birds along the river today displayed a feast of colour. Rainbow Lorikeets. Galahs pink and grey, Red Wrens. White Cockatoos, Brush Turkeys showing off their red and yellow. Male birds dress in feathered finery to attract a mate. Bower birds build wee nests and decorate them. Spendid plumage and sexuality go hand in hand. Black and white birds, and the glossy black Raven, have something in common. Perhaps it is that they are more fearsome and their colour scheme is a marker to beware. Today when the whole gang arrived for their breakfast, Butcher Birds + brown baby, Currawongs, Magpies + babies, Raven + baby, I thought how wonderful it is to have these beautiful beautiful creatures visiting and how sad, that even walking back from the river, aborists were cutting down more and more trees. Sunquist F, 1996, 'The Colorful World of Black White - Black and White Animals,' International Wildlife, May-June.